Space is a popular interest with young children and can encompass a wide variety of learning statements in the Prep Curriculum. This group’s interest was sparked bya lunar eclipse and the reading of the Eric Carle story- Papa, Please get Me the Moon. 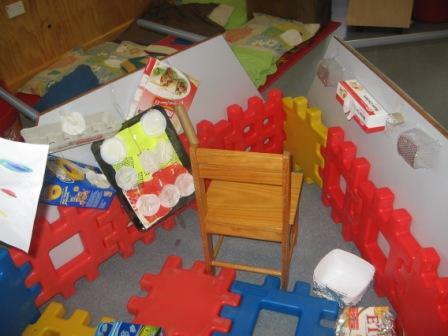 Over the period of time this play occurred the children observed and charted the moon’s shape, investigated the solar system, constructed a space ship to visit the moon and problem solved how to walk on the moon and in outer space, keeping in mind what humans need to live and survive in such places. http://www.nasa.gov/audience/forkids/kidsclub/flash/games/levelone/KC_Grab_It.html This site is a letter matching game using the arm of the space shuttle to grab the correct letters. Fine motor skills were a focus for the class at the time and so lots of activities incorporating these skills were implemented eg. Cutting out astronaut shapes. 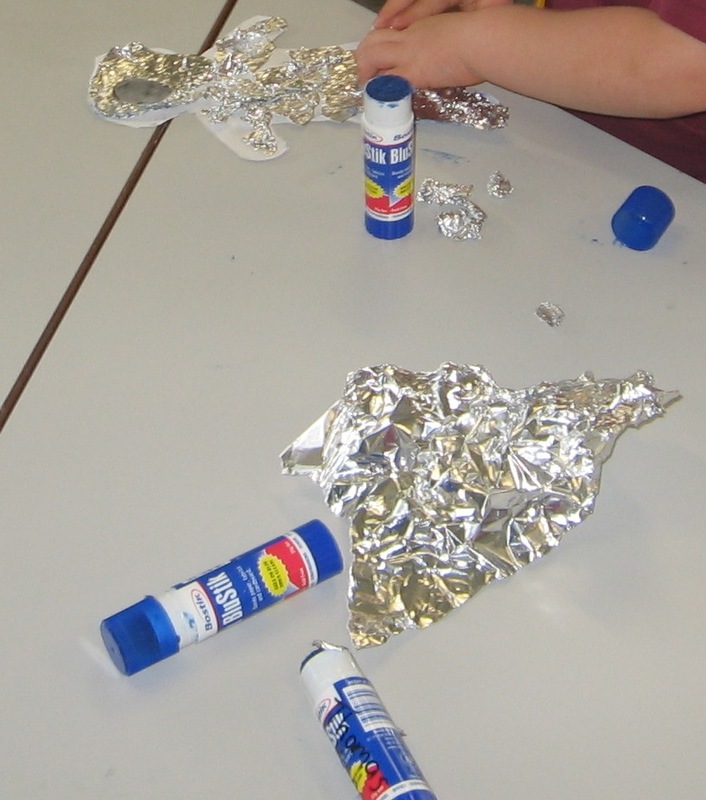 Tearing alfoil and gluing on, to create the space suit. 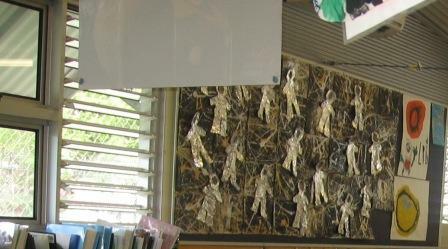 The children marble painted black cardboard using gold and silver paint to create a background for their astronauts. The children also cut out a photo of their face and glued it on their astronaut. This is how we displayed them.Alfoil played a big part in this entire adventure. 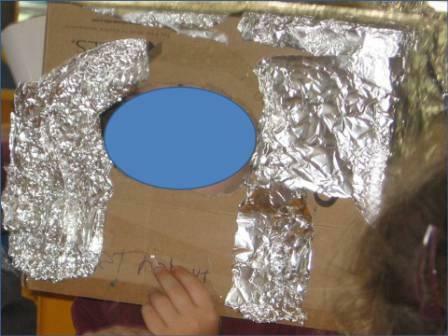 For our trip into outer space they made their helmets out of boxes and covered them in alfoil. Literacy was also enhanced as they created name badges, maps and labels for their space ship. One of the astronaut helmets. Note he wrote astronaut on it. The space ship control panel. We turned 2 tables on their side to create the cone shape for the top of the rocket. 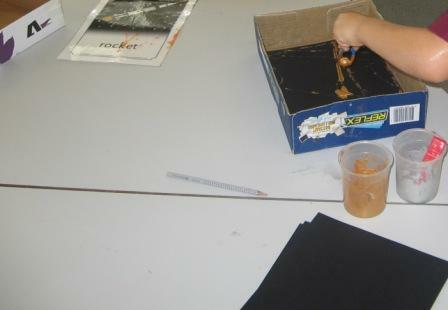 The children painted their own planets, stars, comets etc and even a black hole to create a space environment. More of our vision of space,including our countdown, plus if you look carefully you may be able to spot the satellites, space craft etc that the children made using a variety of construction equipment. Thanks for the fabulous ideas! We are launching into Space at the moment after letters from an Alien but these are some awesome ways to further engage the children across learning areas that I had not thought of. Thank you! Thanks Rhona, although you were present for some of this. Remember …….Aliens in Underpants Save the World and how the kids the kids just loved making the underpants. I couldn’t post the photos because they show the children.